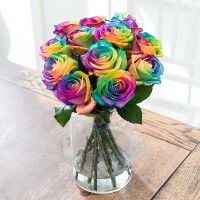 Enjoy this unique bouquet of multicoloured rainbow roses, each bloom is perfectly dyed to create an abundance of colour. Imagine the amazement when your recipient opens the box to this splash of vibrancy. Order this one-of-a-kind bouquet today with Blossoming Gifts, an extraordinary gift they will always remember. Shop our rainbow flowers online now. Also, please be aware that dyed flowers have a shorter lifespan and appearance to undyed flowers. The petals curl at the ends and will start to diminish after approximately 5 days. Therefore we offer a 5 day freshness guarantee rather than the standard 7 days. "Brings a burst of vibrant colour to any room"